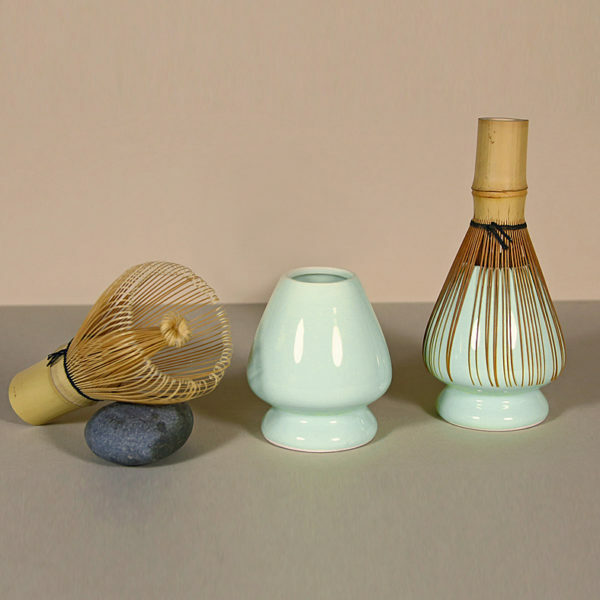 These odd-looking ceramic objects have a serious job to do, but there was always a lot of fun poked at them by customers in our brick and mortar store over the years. Common questions were: Is this a match holder? Is this a candleholder? No, and no. These are kusenaoshi, and their function is to keep the shape of a bamboo tea whisk…..in its proper shape. Tea whisks that are laid flat to dry or placed in storage on their side, will, over time, become mis-shapen. This will affect their performance and encourage the delicate tines of the whisk to snap. After using your tea whisk, just rinse away the remains of any matcha powder in warm water, shake off any excess water and place the damp whisk tines-down over the kusenaoshi. Make sure that the center stem of the whisk goes into the hole in the center of the kusenaoshi and that the delicate tines remain evenly spaced around the outside of the kusenaoshi. Once dry, either store your whisk on the kusenaoshi or in the case it was purchased in, standing base down (tines-up) in your tea cabinet until the next time you need it. Please Note: This is a handmade item – slight variations in the finish, color, tooling, patterning and overall effects of Chinese and Japanese teawares are to be expected. We have carefully photographed this item as best as possible – please be aware that different device screens can render colors and subtle tones slightly differently.